It’s that the time of the year again where companies release their Q3 results. Capital Mind has been following the announcements very closely and we have been tweeting some of the more interesting ones via our Twitter handle @CapitalMind_In (Follow us now for the wonderful tweets and insights). We have also been periodically sending out detailed reports to our Premium Subscribers, intimating them of the results of companies as and when they announce, along with a sector-wise breakdown of performance via Revenue Growths, Profits Growth and EPS growth. Back to the focus of this post. It is mid-February already. The Budget is less than 2 weeks away and everyone, from the noted economist to your resident retiree armed with a newspaper and tons of well-researched opinions, is keeping their eyes and ears open, waiting with bated breath to see what changes, if any, will be ushered in this time. Taking the equity markets as a microcosm of the economy, we can use this as one of the indicators of the performance of the economy as a whole. Now, it has truly been a stellar season for the markets. Nifty is currently at 8,809.35 and the Sensex at 29,135.88; all-time record highs for both. Having said that, over the last few months, the macro-economic triggers and signs that have been popping up have not been as encouraging. We decide to dissect the performances of the 50 Nifty companies to see if the market resurgence has any sound fundamental basis. 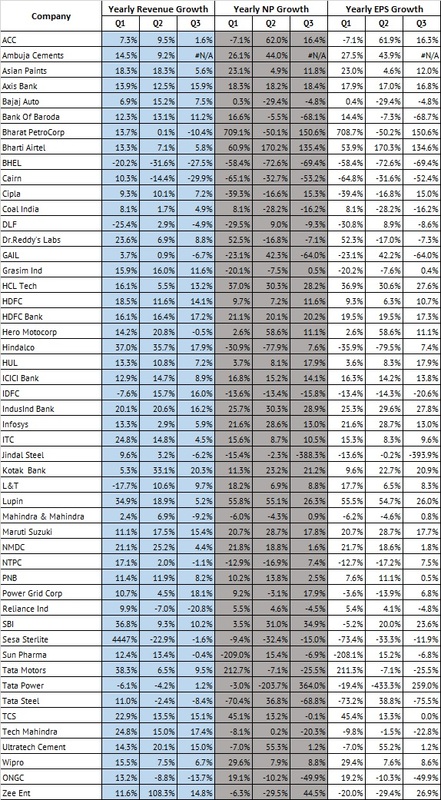 We are analyzing the Q3 results of the Nifty companies that have announced results thus far. Ambuja Cements is the only one left out; they are expected on Wednesday. During this period the Nifty rose from 7944.55 at the close of October 01, to close at 8282.70 on December 31, a gain of 4.26%. Asian Paints continues its strong Revenue and EPS growth in Q3, as does Axis Bank. The travails for Bajaj Auto continue. Interesting stats here, their revenues have been increasing for Q1, Q2 and Q3, but their EPS continues to drop, a sign of them being unable to rein in their expenses. Bharat PetroCorp’s revenue growth was lesser than in Q1 and Q2; in fact Revenues reduced in Q3. However, this was accompanied by an increase in Profits. Airtel too, continues its strong performance, recording a 1.3x jump in Profits. BHEL had another poor quarter. Oil prices seem to have affected Cairn and ONGC numbers pretty heavily. Cipla reverses its trend. From clocking reductions in profits in Q1 and Q2, they now have a 15% jump. Gail is another one that reversed its trend. Jindal Steel had a horrendous quarter. Banks seem to have had a good year as far as profits are concerned (We’ll write a separate detailed post on Banks performances’ a little later). 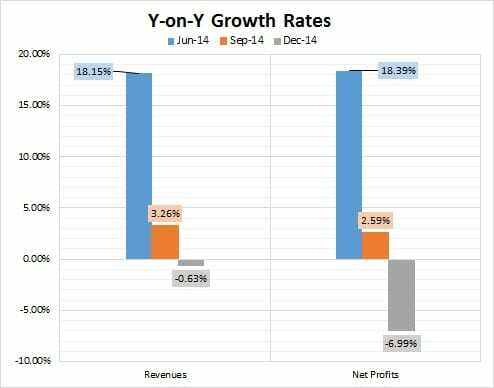 Let’s look at the y-on-y growth of Revenues and Profits of all the Nifty stocks put together. Abysmal performance really. Q1 and Q2 did see diminishing growth rates for both Revenues and Net Profits. Q1 saw Revenues up by 18.2%, while Q2 had a 3.26% growth only. Q3 saw Revenues down by 0.63%, while Profits plummeted by nearly 7%! This abysmal performance by the Nifty companies this quarter can be attributed to a number of macro-economic and company-specific factors including the Crude Oil fiasco, events eastward in Russia and Ukraine, policy measures in India itself and so on. Having said that, that does not take away from the fact that Q3 was indeed, a very shoddy quarter for these firms.